紫菜乾 (Nori)：(紫菜屬紅色海藻的食用乾燥配製品 ) - dried seaweed.Best known as a wrapper for sushi and onigiri. Nori has a fresh, crisp taste. Seaweeds are very nutritious (30-50% protein content and various vitamins). 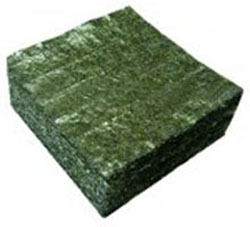 Japan produces about 10 billion nori sheets (20x20cm) a year! 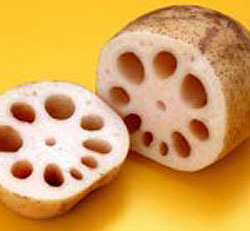 蓮根 (Renkon) - lotus root. Eaten in winter and spring. Rich in vitamin C and potassium. Renkon is associated with long life.Eaten sliced. You can taste it in many Japanese Cuisine dishes.Roots are crunchy and they look great. 豆腐 (Tofu)- soft,white bean curd cake.Made by coagulating soy milk and pressing the resulting curds into blocks. Tofu is low in calories and rich in protein, calcium, iron and phosphorus.It is very easily digestible for the body. 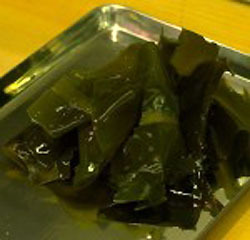 裙帶菜 (Wakame)- another popular seaweed in Japanese Cuisine. Japanese people say that wakame effective in treating hair loss and giving a nice shine to your hair.Harvested from May to June. Wakame very rich in iodine and minerals. Wakame is cut and dried. 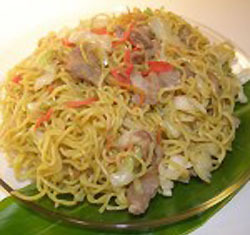 日式炒麵 (Yakisoba)- fried noodles. Made from wheat flour,salt and water. Dried on iron plate with some vegetables or seafood.You can add pork as well. With some ginger sauce this dish tastes the best. 和菓子 (Wagashi)- Japanese sweets. Wagashi are made from natural ingridients. Main ingridient is a sweet paste made from red azuki beans with wheat flour and glutinous rice. 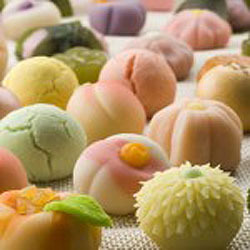 Wagashi sweets are popular gift among the Japanese. color, a mild smoky or salty taste, and a crunchy texture. ● Sometimes tobiko is colored to change its appearance, other natural ingredients are used to accomplish the change, such as, squid ink to make it black, yuzu to make it pale orange (almost yellow), or even wasabi to make it green and spicy. 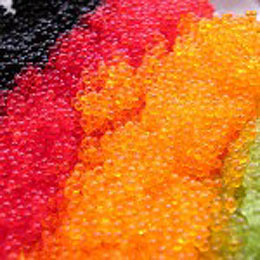 Sometimes a serving of tobiko contains several pieces, each having a different color. When prepared as sashimi it may be presented on avocado halves or wedges. Tobiko is used in the creation of many other Japanese dishes. 紅豆 (Azuki)- azuki beans. Brought to Japan from China about 3000 years ago.Second most popular bean after the soy bean. Azuki beans have a mild taste. Rice cooked with Azuki beans gives the dish a red color. 日式(烤醃)肉串 (Kushikatsu)- Japanese kebab (烤醃肉串). 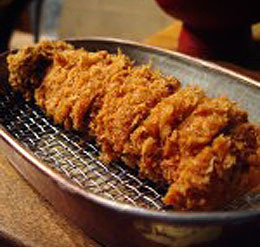 It is a Japanese-style of deep-fried kebab. 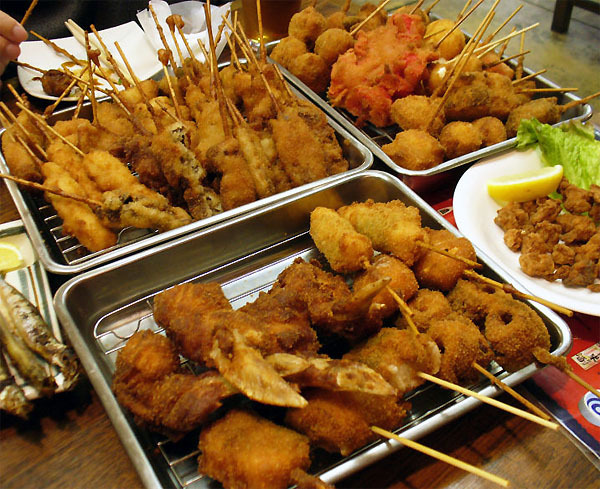 In Japanese, kushi (串) refers to the skewers used while katsu means a deep-fried cutlet of meat. 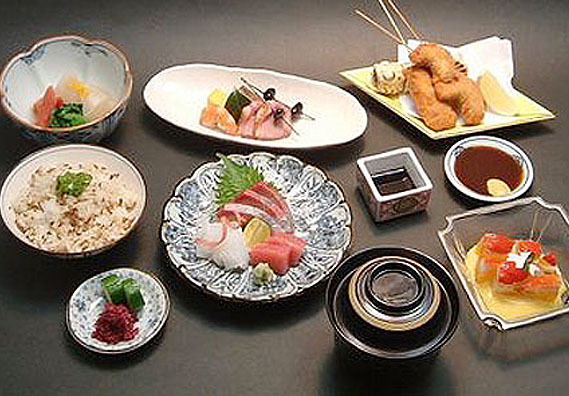 Kushikatsu can be made with chicken, pork, seafood, and seasonal vegetables. 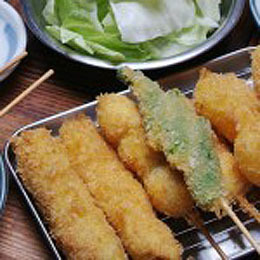 These are skewered on bamboo kushi; dipped in egg, flour, and panko; and deep-fried in vegetable oil. They may be served straight or with tonkatsu sauce. Anything that can be skewered can be used. 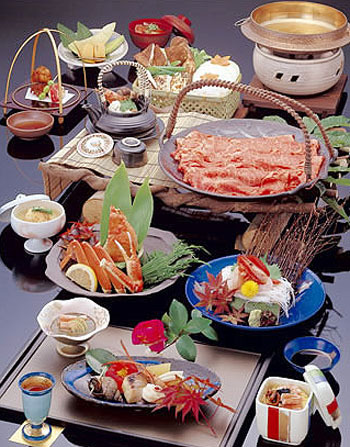 Popular ingridients are: chicken, pork, beef, squid, fried fish, shrimp, eggplant, potato, lotus root and many more. There are special Kushikatsu restaurants, but sometimes you can get it from street stalls. 黄粉, 黄豆粉 (Kinako)- soybean flour. Toasted and grounded into flour from soybeans. Has a nutty flavor. Used as a topping for dishes. Contains protein and vitamin B. Kinako commonly used in Japanese cuisine. 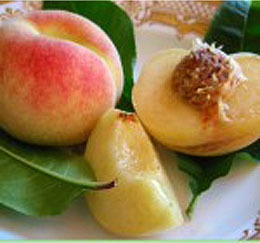 日本水蜜桃 (Momo)- Japanese peaches. 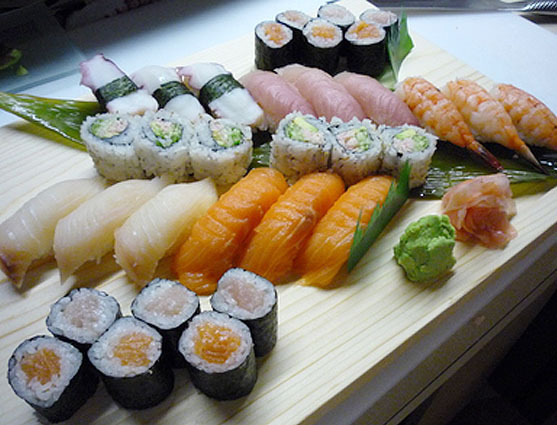 Originally came from China,but have been known in Japanese Cuisine since olden times. Peaches are high in potassium and vitamin C.
河豚 (Fugu)- Japanese pufferfish. or called balloonfish, blowfish, bubblefish, globefish, swellfish, toadfish. Fugu is the Japanese word for pufferfish and the dish prepared from it. Extremely famous Japanese Cuisine dish. Fugu contains a strong poison (tetrodotoxin). Can be cooked by licensed chefs only. Fugu is served as sashimi (生魚片) and chirinabe. 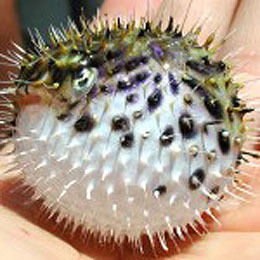 ● Fugu contains lethal amounts of the poison tetrodotoxin in its organs, especially the liver, ovaries, and skin. The poison paralyzes the muscles while the victim stays fully conscious. The victim is unable to breathe, and eventually dies from asphyxiation. There is no known antidote. The standard treatment is to support the respiratory and circulatory systems until the poison is metabolised and excreted by the victim's body. ● Advances in research and aquaculture have allowed some farmers to mass-produce safe fugu. Researchers surmised that fugu's tetrodotoxin came from eating other animals that held tetrodotoxin-laden bacteria and that the fish develops immunity over time. Many farmers now produce 'poison-free' fugu by keeping the fugu away from the bacteria. Usuki, a town in Ōita Prefecture, has become known for selling non-poisonous fugu. 日式糙米糖漿, 甘酒 (Amazake)- Made by letting a mixture of cooked rice, water and koji ferment at 50-60 degrees C. for 12-24 hours. Drunk sweetened and flavored with ginger. Amazake- hot, sweet rice drink. 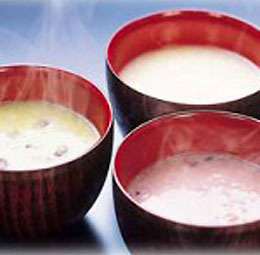 Despite the name, amazake does not contain alcohol. 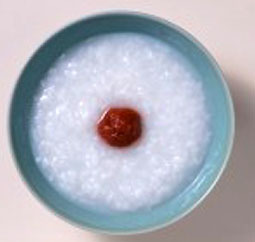 小粥 (Okayu)- Rice porridge. Just rice and water flavored with some salt. Although some toppings as an umeboshi, or furikake, may be used, these should be sober and the rice should not be cooked with ingredients as it starts to resemble zosui.Very simple Japanese dish. 章魚燒 (Tako-yaki)- octopus balls. Means ”fried octopus”. Pieces of boiled octopus covered with batter. Some people add to this meal ginger and green onion. 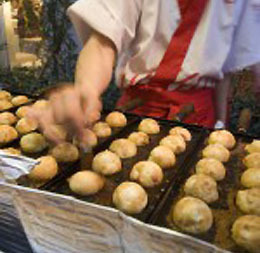 Tako-yaki (章魚燒) are baked on a hot iron plate. Eaten with a tooth pick. 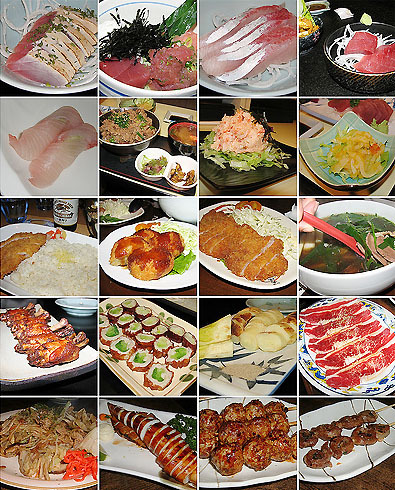 Originally from Osaka (大阪).Very popular meal in Japanese Cuisine. 苦瓜 (Goya)- Japanese vegetable. Goya has a funny look, but very useful food. In English ”bitter melon” has been used in various Asian medicine systems for a long time. Goya is claimed to stimulate digestion. Rich in phosphorus, potassium and magnesium. 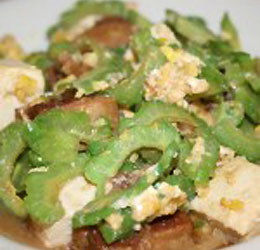 Goya can be eaten in salads, made into tempura or as a stir-fried dish called “goya-champuru”. mushrooms. Cultivated and consumed in many Asian countries. These days you can try Shiitake anywere in the World. Mushroom has long been considered a delicacy as well as a medicinal agent. 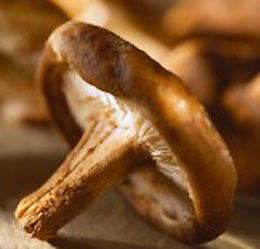 Shiitake mushrooms contain big amounts of vitamin D. Ingredient in many stiamed and simmered dishes. 吉列豬排 (Tonkatsu)，又稱「日式炸豬排」, Pork cutlet Japanese style. Breaded, deep-fried pork cutlets are sliced and served on a bed of shredded cabbage. As dressing a Japanese version of Worcestershire sauce is used; in Nagoya (名古屋) this is replaced by a thick miso-based sauce. This dish was invented in the late 19th century. It was introduced to Japan by the Portuguese. Japanese versions of European cuisine invented in the late 19th and early 20th centuries—and was called katsuretsu (cutlet) or simply katsu. 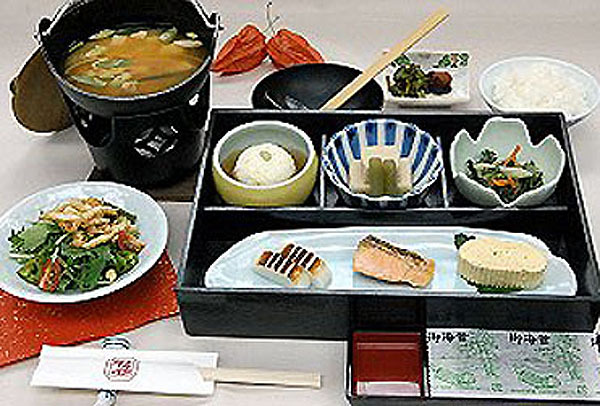 It is served in traditional Japanese style with a bowl of rice, miso soup and pickles. It consists of a breaded, deep-fried pork cutlet one to two centimeters thick and sliced into bite-sized pieces, generally served with shredded cabbage and/or miso soup. Either a pork fillet or pork loin cut may be used; the meat is usually salted, peppered, dredged lightly in flour, dipped into beaten egg and then coated with panko (bread crumbs) before being deep fried. 涮涮鍋 (Shabu)- Another one-pot beef dish cooked at the table, but very different in taste from sukiyaki (鋤燒). 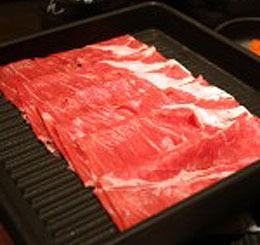 Paper-thin slices of marbled beef are swished for a few seconds with chopsticks in a Mongolian hot pot (蒙古火鍋) with simmering konbu (kelp, 昆布海帶) broth. To Japanese ears, “shabu-shabu” is the sound made when you swish your slice of meat in the hot water. Vegetables (Chinese cabbage, chrysanthemum leaves), mushrooms and tofu are also cooked in the broth. You eat the meat and vegetables after dipping them in one of two dip sauces: a sesame-flavored sauce which goes perfectly with the beef. 神戶牛肉 (Kobe beef) Kobe beef is also called "Kobe niku" (神戸肉, lit "Kobe meat"), "Kobe-gyu"
(神戸牛, lit Kobe cow) or "Kobe-ushi" (神戸牛, lit Kobe cow) in Japanese. Kobe beef in Japan is a registered trademark of the Kobe beef marketing & distribution promotion association. 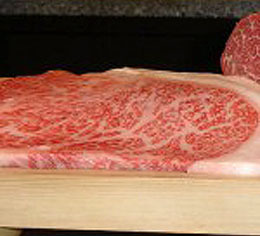 Kobe beef refers to cuts of beef from the black Tajima-ushi breed of Wagyū cattle, raised according to strict tradition in Hyōgo Prefecture, Japan. The meat is generally considered to be a delicacy, renowned for its flavour, tenderness, and fatty, well-marbled texture. Kobe beef can be prepared as steak, sukiyaki, shabu shabu, sashimi, teppanyaki, etc.